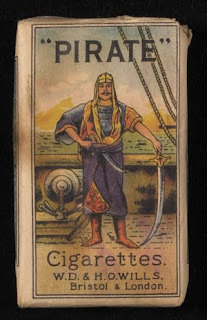 This is one of the rarest examples of a tobacco card. These cards were only issued to American and British military personnel in the South Pacific during 1912. The chances of these cards being stowed away for the trip back home are almost non-existent. Most that were stationed in the South Pacific at that time were merely looking for a smoke break and not a baseball card. There are 97 cards in the set, but no one is known to have a complete set. 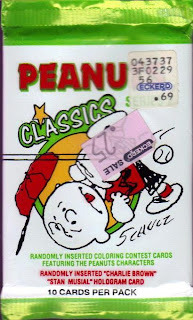 The closest was a 96 card set that sold for nearly one million dollars, including the auction fees. The only card missing was Danny Murphy. This set is so rare that in many instances each card only has one known copy. For those of you with American or British relatives that were stationed in the South Pacific in 1912, check out the items in their estate. If you find a cigarette pack that looks like this, you might have a slim chance of finding a rare card! The cards are in a similar vein as the Red Cross backed cards, also considered a T215 set. 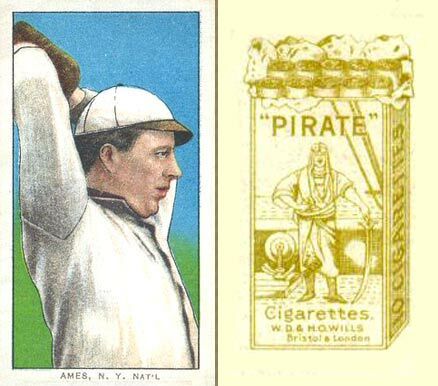 The main difference being the large illustration of the Pirate cigarette pack on the back of the card. If you are fortunate enough to run across one of these cards, consider yourself extremely lucky. The idea of sketch cards are a wonderful idea. I'm always for art infiltrating the hobby. Good or bad, the final result is always up to the consumer. These cards have proven very popular with the collectors that have a background in fine arts. Those who don't appreciate the skill of an artist may have a harder time liking these. The sketches are fine. I don't expect every drawing to look exactly like the player depicted. That's part of the fun of artwork. It allows you to peer into the mind of someone else and see the world through their eyes for a moment in time. No two people see the exact same things in any scenario. That's why a jury is made up of twelve people instead of just one person. I bought this sketch card a while back. It was listed as Jason Frasor of the Toronto Blue Jays. It looked enough like Jason Frasor to have me believe it is him, so I put in a bid and ended up winning this 1 of 1 card for around $10. I was a bit skeptical of Jason being portrayed on a sketch card. Middle relievers aren't usually the subject of special cards. It is Toronto, where people outside of Canada have a tough time knowing exactly who is on the Blue Jays team. Jason has been a part of the bullpen for several years. It made sense. The back of the card doesn't list a name, which was worrisome. I went to Beckett.com to upload the image. I believe that there should be a picture of every card available to the public, so I try to contribute when I can. There was a problem. I couldn't find a listing for Jason Frasor in this sketch set on Beckett's site. I'm used to not being able to find some cards when I search, only to find them later in a different search. I tried being less specific. Nothing. I tried just looking up Jason Frasor. This card was not among the list. Finally, I looked up the checklist from the set. There were several Blue Jays listed. I could rule out all but one. Roy Halladay. Does this card look like Roy Halladay? I'm not so sure. Did an artist submit a sketch of Jason Frasor and Topps just decided that a Caucasian Toronto Blue Jays pitcher must be Roy Halladay? 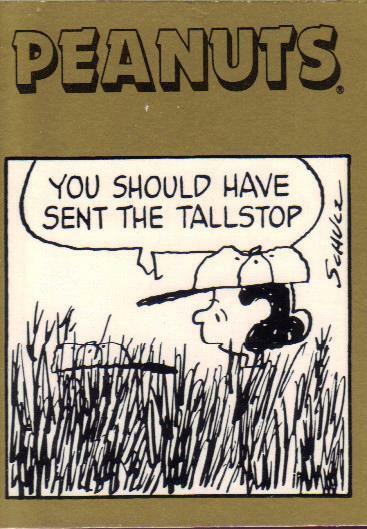 The problem comes on the back of the card. There is absolutely nothing identifying the player as Roy Halladay or Jason Frasor or anyone else for that matter. I wouldn't expect the player's name to be on the front of a card like this. The sketch work is fine, but it's troubling that I would have to search to find out who this player is and still unsure after I see the answer. Either way, I have a nice card on my hands. I'm just undecided as whether it will be a permanent part of my collection or not. Only time will tell. As part of a "non-sport" purchase, I received this pack of cards. 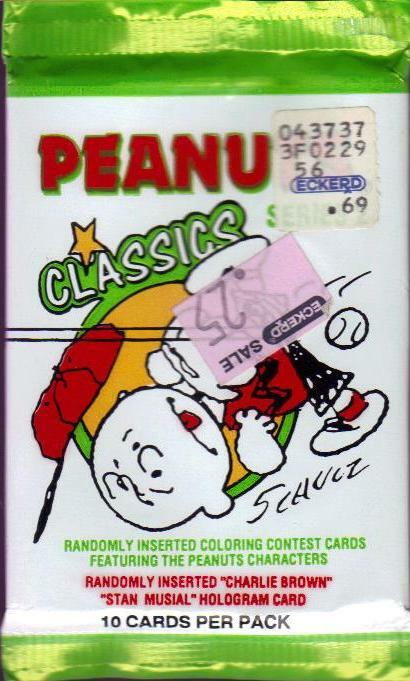 At first, I thought it was a general Peanuts card set. The more I looked at the wrapper I thought this might be worth checking out as a baseball-related item. Randomly inserted in packs was a "Stan Musial Hologram Card." I opened the pack immediately. 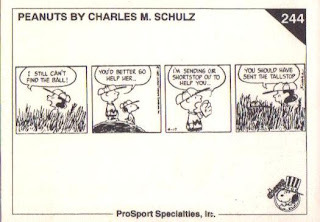 I saw that ProSport had printed the entire strip on the back! 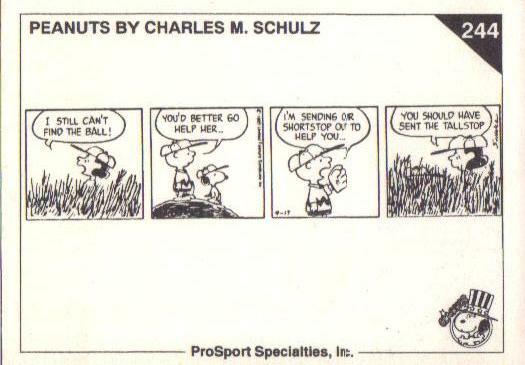 Not only do you get the frame on the front, but the context of the frame within the whole strip as well! What a great idea! 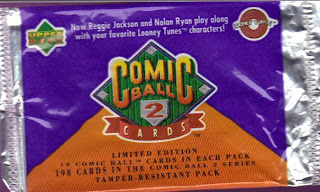 Of course, I did not pull the Musial hologram, but reading through the 10 comic cards was a thrill anyway. 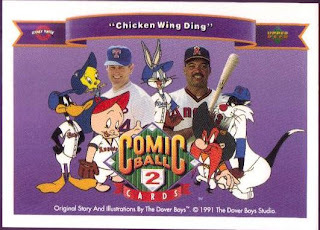 Aside from Bazooka Joe, I hadn't seen cards with comics on them like this. 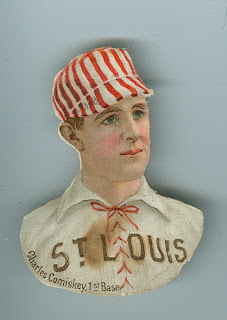 Issued directly after the 1887 season, this 18 card set features 9 players each from the American Association's St. Louis Browns (the modern day Cardinals) and the National League's Detroit Wolverines (a team that disbanded in 1888). These two teams met in the World Series in 1887. The Wolverines beat the Browns 10 games to 5. The Wolverines won the series on October 21st, but since the games were already sold, the teams played the remaining four games. 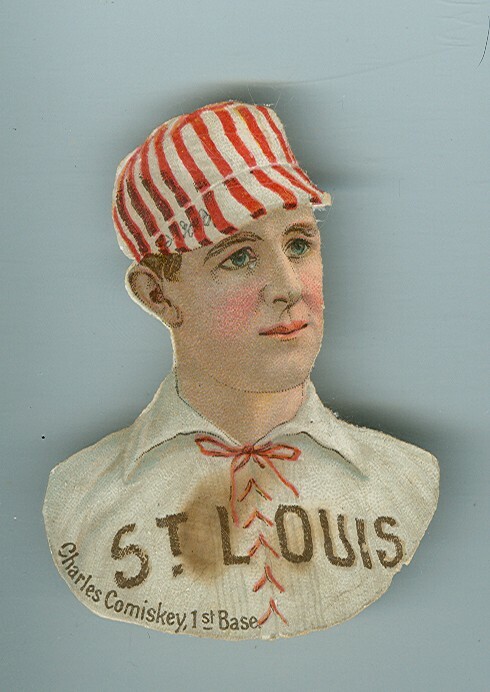 While there are Hall of Fame players in the set (Dan Brouthers, Sam Thompson and Ned Hanlon), the most valuable and most sought out is the Charles Comiskey. 19th century cards are usually riddled with errors and this set is no exception. Charlie Getzien's name is misspelled. 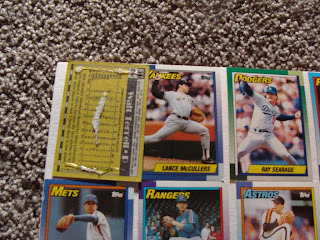 These die cut cards were popular in its day and were prime candidates to be glued into albums. It's extremely rare to run across examples of these cards today that haven't spent some time glued into an album. What have we learned from these cards? Despite what revisionists would have you believe the World Series and die-cut cards are not inventions of the twentieth century. They've both been here all along. Let us delve into a pack of cards I received as part of a "Non-Sport" purchase. Taz gives Reggie a high-five. 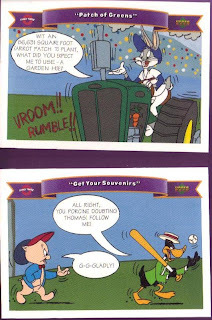 Each card features a title ("Seventh Inning Stretch" here), the Looney Tunes and UD logos and some kind of picture. Sometimes, the pictures are of actual people. Other times, well, it's just looney. 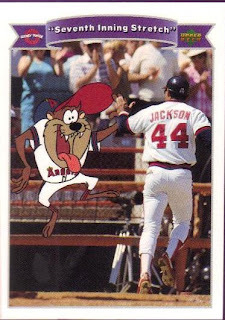 Every card ties the Looney Tunes cast into a baseball-related scenario. The backs of the cards feature trivia questions with answers. What was the name of the LAST Bugs Bunny cartoon to be released in theaters? No, really, without Google. Go ahead. Okay, fine, it was in 1964 and it was "False Hare." Happy now? I'm not sure if you put the cards in order they would tell a story. Judging by the dialogue, I would have to guess yes. Judging by the talking bubles, I'd have to say the writers are probably out of work these days. Well, most folks are out of work at UD these days. This appears to be the title card. Reggie and Nolan are smiling all the way to the bank. Though, I'm not sure just how many of these packs were actually sold. You can see the "photoshop" technique employed with multiple layers, masking, and more. Do you see that!? Dupes. In a single pack, I get dupes. Yeesh. "So, Nolan, you're one of the greatest pitchers ever, right? Well, we'd like to take some pictures of you pretending to talk to Bugs Bunny. Yes, I said Bugs Bunny. Hello? Hello, Mr. Ryan?" 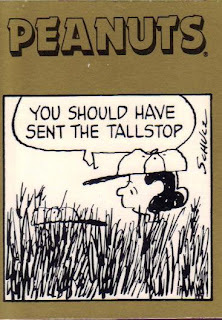 *This post appears in a three-way cross-posting between "APAD," "A Pack To Be Named Later," and "Things Done to Cards." Yes, I took the frame apart to see how the cards were attached. With a little prying, the crime had become blatently obvious - it was.... soap... poisoning... Er, I mean, it was GLUE! Is that the biggest crime here? That is dependent upon your point of view. The fact that these are 1990 Topps and not 1968 is a good sign. The fact they aren't serially numbered, game-used items is also a nice touch. The fact that I don't know several of the players on the board is where I get mixed feelings. On one hand, it would be nice to have a display of well-known players of the time. On the other, if they were well-known, would we want them glued to the cardboard insert that came with the frame? That's a toughie. Feel free to chime in. I thanked my mother-in-law profusely for the frame and assured her it was better she bought it for me to appreciate than to wind up in the trash bin where it was probably headed (though, I am sure I put that much more delicately). Besides, when you live next door to your mother-in-law and on your in-law's land, it's always better to choose your battles carefully. 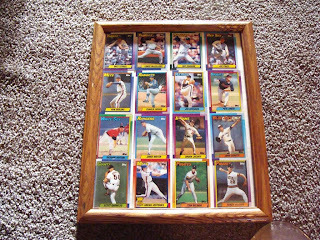 Baseball cards glued into a picture frame is not one of those times. For those interested, the cards are: Walt Terrell (Yankees), Lance McCullers (Yankees), Ray Searage (Dodgers), Joe Price (Red Sox), Ron Darling (Mets), Charlie Hough (Rangers), Jim Deshaies (Astros), Pete Smith (Braves), Richard Dotson (White Sox), Jamie Moyer (Rangers), Brook Jacoby (Indians), John Cerutti (Blue Jays), Scott Garrelts (Giants), Gregg Jefferies (Mets), Stan Belinda (Pirates), and Randy Kramer (Pirates). Oh, and I taped Terrell back into place after the picture. I didn't have any glue handy. Depending on what school of thought you subscribe to, these commemorative patches are the best thing since sliced bread, the worst thing since Hitler or so completely indifferent that you are barely aware of their existence. Me? I'm pretty indifferent to them. I think the idea behind them is pretty cool. A specially manufactured patch commemorative a certain event, embedded into a baseball card with a small picture of someone from that specific event who did something cool. The idea is pretty solid. The reality of these patches is that you will more than likely pay a premium on the secondary market for something that wasn't from the era of the specific event. That's not so hot. For instance, this commemorative patch card sold for as much as the blaster that it was found in cost. What's so special about a patch recently made to commemorate an event? There are patches commemorating an event featuring the likes of Ryan Zimmerman and Mark Teixeira, but I'll bet that they won't pay for the price of the blaster. Is it because Lou Gehrig's picture is on the card? Is it because the card features a Hall of Fame Yankees player? Is it because the subject on the card is from a vintage era? For some reason, I don't imagine Robin Roberts commemorative patch going for nearly as much unless a few die-hard Phillies fans get into a bidding war. If a 1937 World Series era patch was featured in this card, I could see this selling for an astronomical price. Alas, the patch is most likely vintage 2009. Maybe someday, I will understand the allure of manufactured patch cards. Sure, the one I have in my collection is pretty cool. It's a Carlton Fisk manufactured patch card featuring a silhouette of the "wave" from the 1975 World Series. Part of what makes the Fisk card so cool was the low price that accompanied the card. $5.00.